SWP iPod Manager is very easy to use tool to manage your iPod Device(Any Type), You will not need any other software with iPod Manager. With iPod Manager, you can Add, Edit, Delete Audio/Video Tracks to your iPod; Also you can copy tracks from iPod to your local hard drive. SWP iPod Manager is compatible with other iPod programs like iTunes. 4- Add Audio/Video Tracks to the iPod. 5- Delete Audio/Video Tracks from the iPod. 6- Modify the properties of the Audio/Video tracks of the iPod. 7- Copy Audio/Video tracks from iPod to local hard drive. 8- Clean duplicated (repeated) Audio/Video tracks from the iPod. 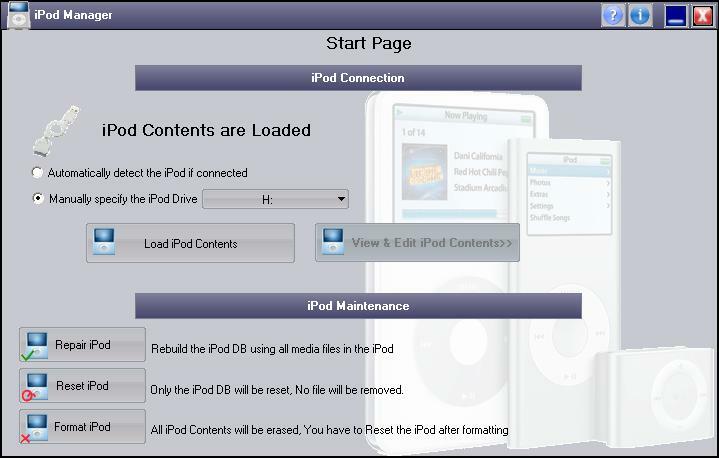 9- Rebuild the iPod Data Base using all existing Audio/Video files in the iPod in case of damaged Database. 10- Reset the iPod Database. 12- Search in the tracks properties to easily find the desired track. Qweas is providing links to SWP iPod Manager 1.0.0.5 as a courtesy, and makes no representations regarding SWP iPod Manager or any other applications or any information related thereto. Any questions, complaints or claims regarding this application SWP iPod Manager 1.0.0.5 must be directed to the appropriate software vendor. You may click the publisher link of SWP iPod Manager on the top of this page to get more details about the vendor.